Left to right: 1) Hongzhuan Chen (Vice-President, Shanghai Jiao Tong University School of Medicine), 2) Yan Feng (Vice-President, Office of Research Management, Shanghai Jiao Tong University), 3) Yifeng Xu (President of Shanghai Mental Health Center), 4) Mark Rapaport (Chairman, Department of Psychiatry and Behavioral Sciences, Emory), 5) Barbara Rothbaum (Associate Vce Chair of Clinical Research Professor in Psychiatry, Emory), 6) Michael Phillips (Director Shanghai Mental Health Center -- Emory University Collaborative Center for Global Mental Health), 7) Zeping Xiao (Deputy Director General, Shanghai Municipal Health Bureau). 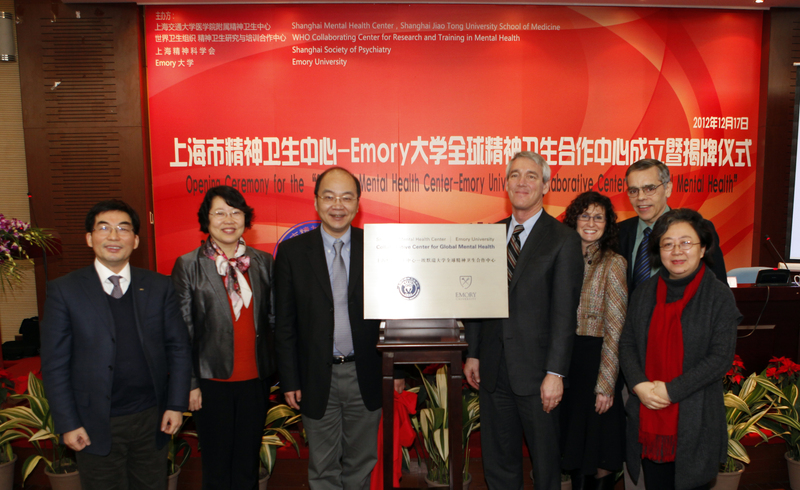 On December 17, 2012, Shanghai Jiao Tong University and Emory University formally opened the Shanghai Mental Health Center-Emory University Collaborative Center for Global Mental Health. The new Collaborative Center, housed on the campus of the Shanghai Mental Health Center, was developed to advance shared research projects among faculty members at the two institutions. Shanghai Mental Health Center, which is one of the largest mental health institutions in China, is responsible for coordinating clinical services for the 22 million residents of Shanghai, and treats an astonishing one million patients per year. Emory University's Woodruff Health Sciences Center is known for its prominence in research related to mental health and the neurosciences. "This collaboration will help researchers and clinicians in China to keep up-to-date with the exciting, cutting-edge research being conducted at Emory's Department of Psychiatry and Behavioral Sciences," explains Michael Phillips, who was named the director of the Collaborative Center. "As a platform for academic exchange, this new Collaborative Center will expand Emory's opportunity to understand and participate in the dynamic transformation of China's mental health services." Phillips received his psychiatric training in the United States, but has lived in China since 1985 while conducting mental health research. He is a faculty member of the Department of Psychiatry and Behavioral Sciences at Emory University School of Medicine, the Department of Global Health at Emory's Rollins School of Public Health, and a faculty member at Shanghai Jiao Tong University and Shanghai Mental Health Center. It is estimated that 173 million people in China have mental illness, and about 158 million of them have never sought any type of treatment. China started a major health reform in 2009 that has greatly increased the priority put on mental health, as shown by the recent passage of China's first national mental health law on October 26, 2012. 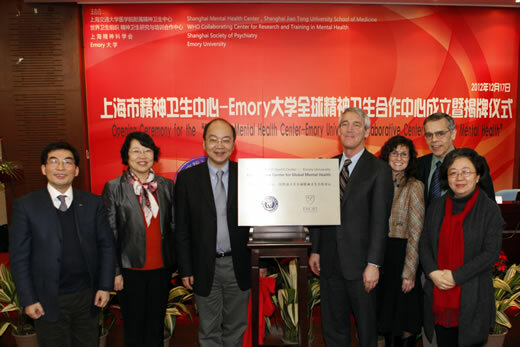 The collaboration between Emory and the Shanghai Mental Health Center will assist in facilitating and monitoring the changes as the new law is implemented. The law is intended to completely transform the provision of mental health services in China by standardizing care and requiring large urban hospitals to set up clinics — or provide counseling — for people living in rural areas. The law also stipulates that a qualified psychiatrist must make the determination of mental illness to prevent people from being hospitalized against their will, and promotes transparency of patient treatment to insure human rights are not violated. Over time, the Shanghai Mental Health Center-Emory University Collaborative Center for Global Mental Health will expand to develop joint research partnerships with institutions around the world. "This collaborative Mental Health Center melds the strengths of two strong research and training departments at Emory with the remarkable breadth and strength of the Shanghai Mental Health Center and Jiao Tong University," says Mark Hyman Rapaport, Reunette W. Harris professor and chair of Emory's Department of Psychiatry and Behavioral Sciences. "We have an extraordinary opportunity to address unique and important mental health research questions, and create new models of training future leaders in brain research." The Department of Psychiatry and Behavioral Sciences at Emory University School of Medicine and the Department of Global Health at Emory's Rollins School of Public Health, provided the initial funding for this project. The Emory Global Health Institute provided a seed grant for exchange trips between the two institutions to establish the structure, activities and funding sources for the Center.